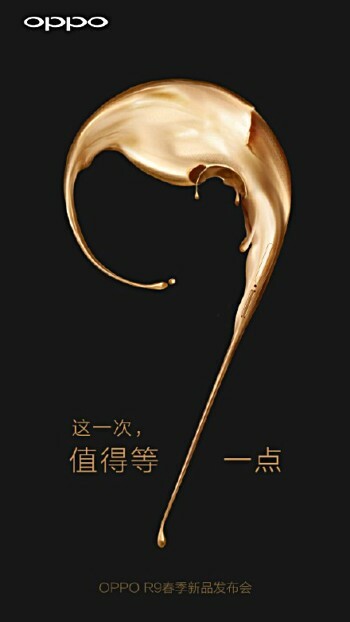 Oppo has released a new teaser that confirms the existence of the rumored R9 smartphone. It seems to be a camera-centric device given that the Chinese text in the teaser translates as "This time, it is worth and other '9' point. #OPPO New camera phone R9 #." Sadly nothing else was revealed, but given that the Chinese company has finally confirmed the handset, we expect to see more teasers and leaks in the coming days. A leak last year suggested that the device looks almost identical to the iPhone 6s Plus. Specs-wise, from what all has been rumored until now, the Oppo R9 will be powered by a Snapdragon 820 SoC and sport a 6-inch (1440 x 2560 pixel resolution) display. It will come with 3GB or 4GB RAM and 64GB of expandable internal memory. In terms of camera, the handset will feature 21MP rear unit and a 13MP front shooter. Packing in a 3,700 mAh battery, the R9 will run Android 6.0 Marshmallow out-of-the-box. 6 inches display is just too large a one hand operation. This years is going to be Sn820 year. 80% of flagships is going to have this soc. Distribution is the real problem.